One question we often get here at The Yeung Institute is about the best age for a facelift. While we’d love to have a simple, across-the-board answer, the fact is that your ideal age may be completely different from someone else’s, and it all depends upon the skin you’re in. With this in mind, we’re going to supply you with a few of the things we tell our patients here in Houston. In determining when you should get a facelift, you need to consider what you’re up against. You may have applied all the sunscreen in the world and taken extremely good care of your face, but if your genes are predisposed to aging early, there’s little you can do to stop Mother Nature in this regard. So, if you want to take a peek into a crystal ball, all you need to do is look at a parent or older relative to get an idea about what your skin might look like a few years down the road. The skin around your face and neck is also typically the first to show signs of aging because it’s arguably the most exposed area on your body. Every year, your skin performs its job admirably, protecting you against the elements, but this protection comes at a cost. All of those days lounging by the pool - with nothing more than a pair of sunglasses and no sunscreen - will come back to haunt you. Throw in the dry climate here in Texas, and the elements will leave their mark a little earlier than you may like. Taken together, you can see that there’s very little recourse in the forces you’re up against. But it doesn’t mean you’re helpless. We offer a number of anti-aging solutions that can help arrest and erase the passage of time on your skin, from chemical peels to state-of-the-art facial rejuvenation treatments. 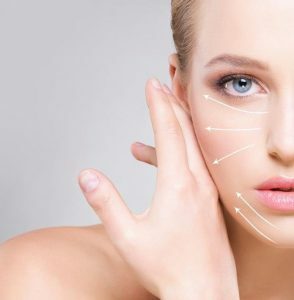 While these solutions go a long way toward helping you maintain a more youthful, vibrant appearance, none provide the dramatic, long-term results that a facelift surgery does. As we’ve discussed, your skin at 40 may be more prone to premature aging than your friend’s skin at the age of 50, so each case is different. If you weren’t blessed with great genes and a lifetime of proper skin protection, you may want to consider a facelift in your late 40s or 50s. If you are blessed with great skin, you may want to wait until you’re in your 60s before taking the leap, which will provide you with a clean slate as you enter your Golden Years. A good facelift is one that shaves years from your face, and you’re able to carry these results moving forward. While your skin will continue to age after a facelift, we reset the start button on aging. When deciding upon the ideal timing for your facelift, you should note that there are different types of facelifts. Younger patients may benefit from earlier intervention on a lesser scale like a mini facelift. For example, facial plastic surgeon Dr. Cecil Yeung offers an endoscopic facelift that targets your upper cheeks alone, which you can combine with jowl and eyelid surgery. This is the type of thing many of our patients do in their 40s and 50s. Or you may opt for a more involved procedure in your 50s or 60s, in which case you’re in great hands. Dr. Yeung pioneered a technique called a deep plane facelift, wherein he not only pulls your skin taut, but he also repositions your facial muscles for maximum effect, giving you results that go more than skin deep. The bottom line is that while the forces against your skin may be formidable, we are more than up to the challenge. If you want to gain the upper hand on aging, please come in and sit down with us so we can review your options.